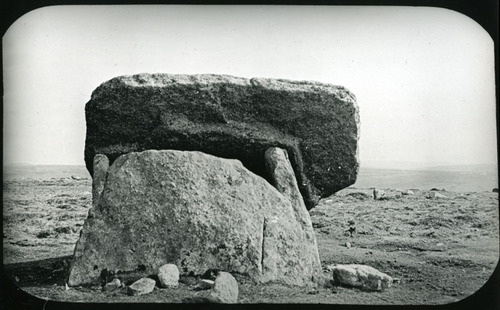 This photograph of the quoit on Mulfra Hill clearly shows the acute angle at which the capstone lies. According to H R Jennings1 it was displaced during a thunderstorm in 1752, although William Borlase is known to have seen the cromlech in this position on the 23rd of October 1749, and Jennings' source, presumably the Philosophical Transactions of 1752, actually referred to a natural stone, also known as quoits, on Mulfra Hill which was struck by lightning in that year. Borlase excavated within the chamber and discovered a 20 inch pit at the centre, but found only "that something which either was originally, or has since turned black, was placed at the bottom of it." The capstone now has a HP monogram carved almost dead centre, and which is not present in this view. Image courtesy of and © Cornwall Record Office. William Copeland Borlase noted in 18722 that, in the time of William Borlase, "a stone-barrow, now entirely removed, measuring two feet high, and thirty-seven in diameter, surrounded the monument. There is little doubt that the removal of the southern supporter caused the overthrow of Mulfra Quoit. It might indeed be possible that the cap-stone was never actually raised to the position for which it was intended: but the fact of a fracture having taken place in it, as well as the angle at which it now stands, which is precisely that it would have assumed had it been overbalanced and slipped from its place, presents no analogy to the case of Lower Lanyon, and confirms the supposition that it is simply a fallen Cromlech." Image courtesy of and © David Thomas. 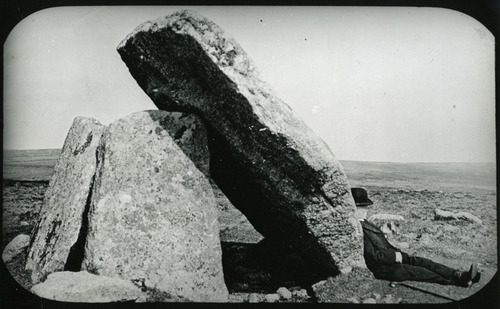 Another late Victorian view of Mulfra Quoit showing a gentleman with bowler hat and walking stick resting against the capstone and presumably taking in the fine view towards Mount's Bay and St Michael's Mount. 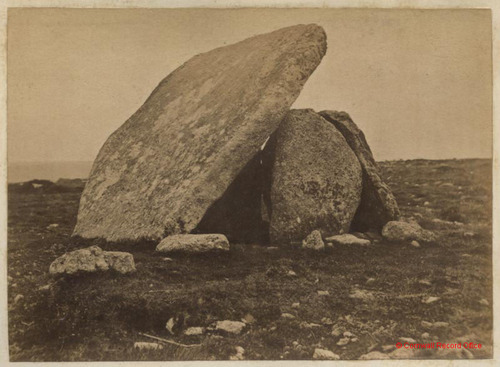 Glyn Daniel described the monument as "A rectangular chamber at present consisting of only three orthostats forming the northern, southern and eastern sides of the chamber with the capstone displaced and resting partly on the heads of the northern and southern orthostats. There are traces of a round barrow about 40 ft. in diameter. "3 Image courtesy of and © David Thomas. 1. Jennings, H R. 1936. Historical Notes on Madron, Morvah and Penzance. Saundry. 2. Borlase, William Copeland. 1872. Nænia Cornubiæ, a descriptive essay illustrative of the sepulchres and funereal customs of the early inhabitants of the County of Cornwall. J R Netherton & Longmans, Green, Reader and Dyer (Facsimile, Llanerch Press, 1994). 3. Daniel, Glyn. 1950. The Prehistoric Chamber Tombs of England and Wales. Cambridge University Press.